There are many situations when you may need to replace your car keys. The transponder may stop responding, the key could break in the ignition, your keys were stolen, or maybe the keys were simply lost. Knowing what kind of key you have is beneficial in anticipating the possible costs for replacing lost, stolen, or broken keys. Many early cars were equipped with a master key intended to be used to make copies or replacement keys for a car. It was not intended for normal use. Master keys were hundreds of dollars to replace, and sometimes it was necessary to replace the whole engine management system, potentially costing thousands of dollars. Most cars nowadays do not come with master keys, however, if you purchase a used car, double check the owner’s manual to see if you should be receiving a master key with the other keys. This type of key has a microchip in the key handle, and are more secure than the traditional car key. Transponder car keys have been used since 1995. When inserted into the ignition, a sensor responds and activates the transponder. The price to copy a transponder key is anywhere from $40 to over $100. To replace entirely, a dealership may charge around $250, while going to a locksmith will be less expensive. Another type of transponder key is the rolling code key. Introduced in 1999, this key sends a new code every time the car is used, protecting the car more securely than traditional transponders. Replacing this type of key is very expensive, typically $500 or more per key. A switchblade key is a key that folds within itself much like a switchblade knife. Typically, there is a button that will pop out the key for use. It can cost around $200-$300 to replace the whole thing, although if just the shank needs to be replaced, the cost is around $75. Some cars come equipped with a key specifically for valets. This key allows the owner to give a key to a valet that will only unlock the doors and start the car. It cannot open the trunk, glove box or perform other functions. A smart key is a fob that when it is within range of the car, it will enable the car to turn on by the press of a button. It does not need to be inserted into the ignition. 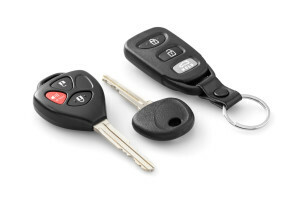 These keys have to be replaced through the dealership and can cost anywhere from $200-$400. It is always a good idea to keep an extra key on hand or at home. Sometimes when keys are lost or stolen, it may be necessary to completely replace the locking system in your car. That can cost thousands of dollars in materials and labor. In emergency situations, contact a mobile locksmith to help you out of the bind. It will be less of a hassle and will cost less than towing your car to a dealership.